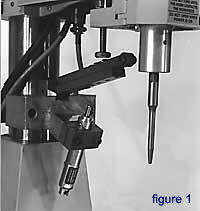 This device, used primarily for staking or forming operations, helps minimize the bent posts or damage which often occurs with fine parts. 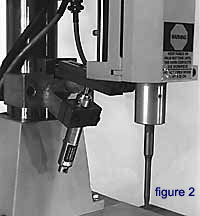 It slows the horn descent during the weld time only, thus, allowing proper melting of the post. 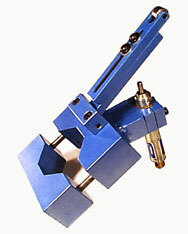 For welders without a pre-trigger setting (usually used for staking), this device activates the force trigger to start the sonics before part contact, insuring staking consistency. Since deceleration occurs during the weld time only, the ram is allowed to come down at full speed until contact and return at full speed after the weld. This decreases overall cycle time compared to slowing the welder’s head speed to allow proper welding. Decelerating ram speed just before impact is great for thermal staking applications.